← Swan Lake ballerinas to come! I really love this pose and hope I will be able to do it justice! I have this image on acrylic canvas paper now and am planning on trying it in acrylics first. 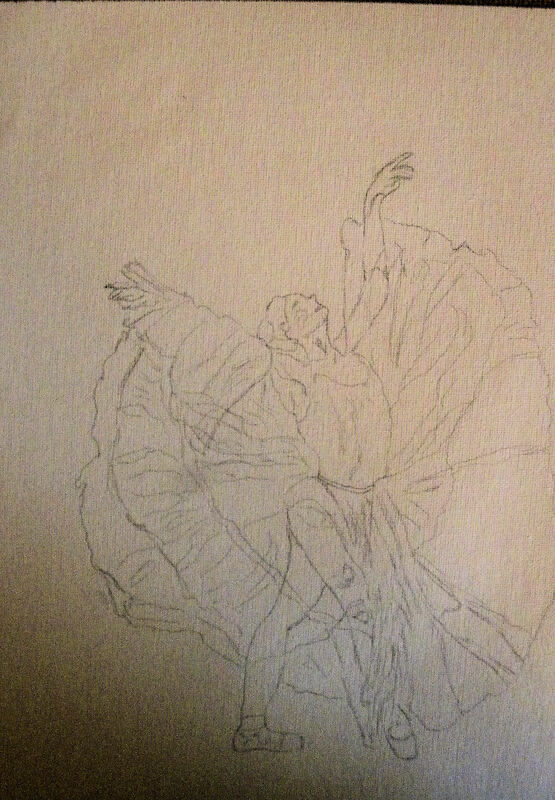 Sorry that the photo isn’t the greatest, but I didn’t want it to be traced too darkly so the pencil on the canvas paper doesn’t show up real well. I found this picture in some type of ballet brochure I received in the mail years ago and saved. I traced it and enlarged it several sizes. Her outfit appears very sheer which I am hoping to be able to convey. Posted on May 13, 2015, in Art Talk and tagged acrylic paintings, acrylics, ballerinas, Ballerinas #2, ballet, Degas, Degas Copies, Edgar Degas, Gothic ballerinas, Swan Lake ballerinas, Twirling Ballerinas. Bookmark the permalink. 4 Comments. Looking forward to seeing her come alive. Thank you, Mary! She came alive quite well, but I haven’t had a chance to photograph the painting yet. I did go out and buy a frame for it, though, and it’s hanging on my wall with the others! I love the way it turned out. Can’t wait to share it tomorrow hopefully!